English Garden Cottage was my class demonstration in North Texas today, and it was fun to paint one of the subjects I enjoy so much. 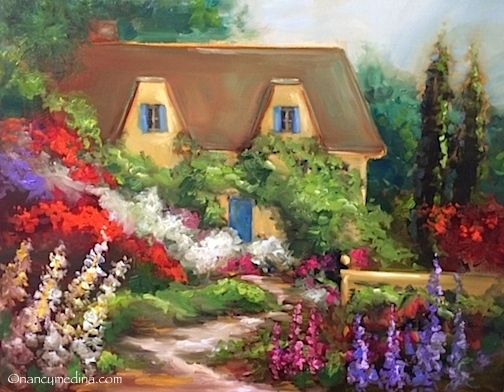 Inspired by the cottage gardens of Coronado, California, I'll be inviting my students to join me to visit a few of my absolute favorite cottage gardens there during my August workshop coming up in San Diego. I like to imagine little worlds in these cottage paintings, and undoubtedly there is a double kitchen window open out back, with a couple of fresh cherry pies cooling on the windowsill. There is bound to be a yellow house kitty napping on the front doorstep, and the door is always unlocked. The price of admission is just a bit of weeding in the garden, and the reward is a flower garden that never ends. Welcome!